An optical image from the 0.6-m University of Michigan/CTIO Curtis Schmidt telescope of the brightest Radio Planetary Nebula in the Small Magellanic Cloud, JD 04. The inset box shows a portion of this image overlaid with radio contours from the Australia Telescope Compact Array. The planetary nebula is a glowing record of the final death throes of the star. A new class of cosmic object ? dubbed a ?super planetarynebula? ? has been identified by astronomers. Planetary nebulas are shellsof gas and dust expelled by stars near the end of their lives and aretypically seen around stars comparable or smaller in size than the sun. Thesenebulas aren't related to planets ? the name arose because they resembled giantplanets when viewed through early telescopes. A team of scientists in Australia and the United States identified the new objects when they surveyed the MagellanicClouds, the two companion galaxies to the Milky Way, with radio telescopesof the Commonwealth Scientific and Industrial Research Organisation (CSIRO)Australia Telescope National Facility. They noticed that 15 radio objects in the Magellanic Cloudsmatch with well known planetary nebulas observed by optical telescopes. The membersof the new class of objects are unusually strong radio sources. Whereas the existing population of planetary nebulas isfound around small stars comparable in size to our sun, the new population maybe the long predicted class of similar shells around heavier stars. The team thinks that the detections of these new objects mayhelp to solve the so called ?missing mass problem? ? the absence of planetarynebulas around central stars that were originally one to eight times the massof the sun. The nebular material around each star may have as much as2.6 times the mass of the sun, whereas the material around smaller stars weighsin around only 0.3 times the mass of the sun. 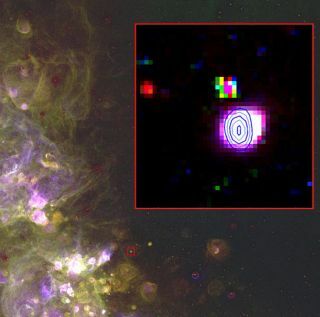 "This came as a shock to us," said MiroslavFilipovic of the University of Western Sydney in Australia, "as no oneexpected to detect these object at radio wavelengths and with the present generationof radio telescopes." The team was so surprised, they held up their findings forthree years until they were completely sure that the objects they spotted werein fact planetary nebulas, Filipovic said. Some of the 15 newly discovered planetary nebulas in theMagellanic Clouds are three times brighter than any of their Milky Way cousins.But to see them in greater detail astronomers will need the power of a comingradio telescope ? the SquareKilometre Array planned for the deserts of Western Australia. The new findings is reported in the journal Monthly Noticesof the Royal Astronomical Society.